Since September 2018, Cotswold Archaeology has been carrying out archaeological investigations in Wickham, Hampshire. 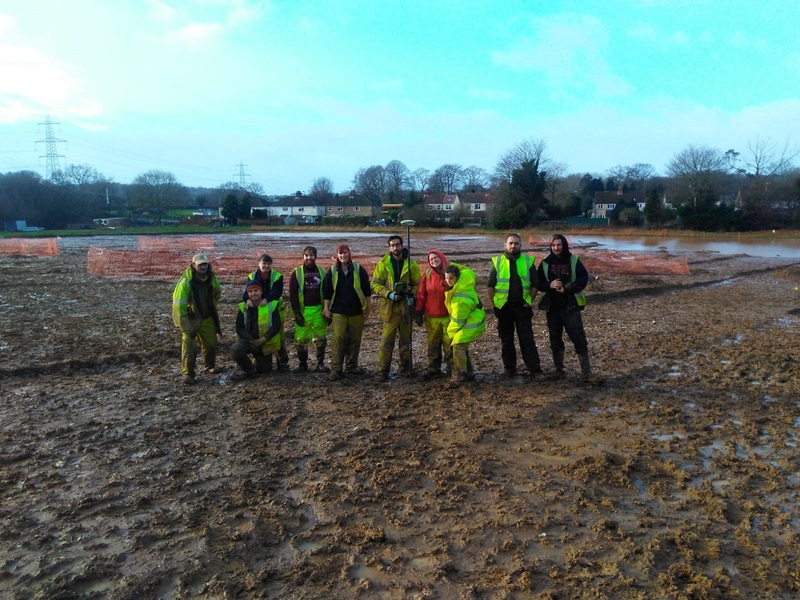 Working with developer Croudace Homes and Winchester City Archaeology, the investigations are being undertaken prior to the construction of a new residential development of 82 homes. This is not the first time archaeologists have visited this site however, with work beginning in the late 1960s. These early investigations revealed evidence of Roman activity, including both domestic and industrial debris. 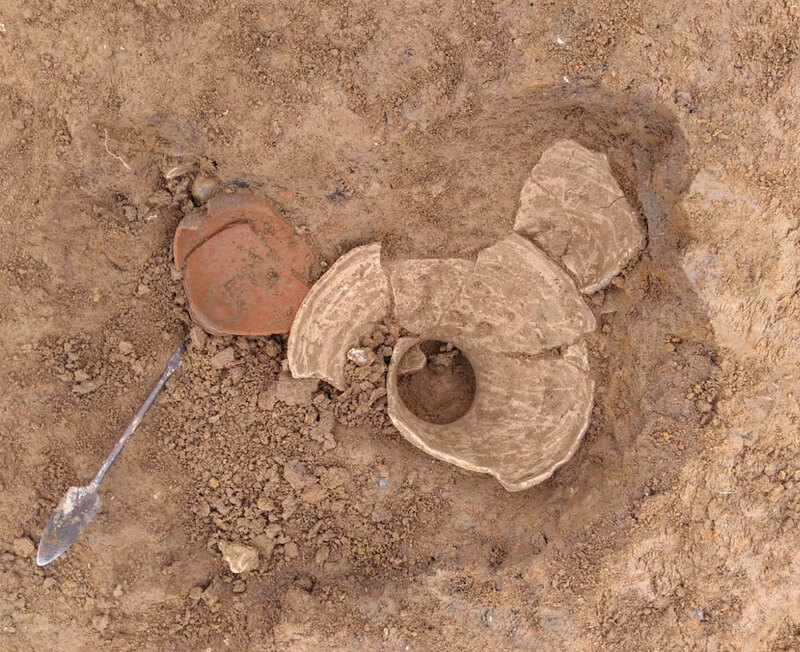 Investigations in the early 21st century recorded late prehistoric pottery, and our investigations expand upon two previous phases of trial excavations undertaken in 2014 and 2018. Since September our archaeologists have revealed the extent of Roman roadside settlement activity which is currently thought to have had its heyday within the 1st and 2nd centuries AD, perhaps as a kind of Roman ‘service-station’. We have uncovered evidence of post-built structures, multiple enclosure ditches and several large waste pits, from which we have found a wealth of pottery and other kiln debris. Amidst the Roman archaeology, Bronze Age cremations and worked-flint were also discovered, suggesting the presence of human activity in this area as early as the Mesolithic period. As an educational charity, CA are dedicated to delivering outreach and community engagement programmes within the local area, using both on and off-site approaches and digital technology, to help widen access for engagement and participation. As part of our investigations at Wickham, an Open Day was due to be held on Saturday 24th November. Whilst our archaeologists are prepared for all weathers, in this instance severe wet weather compromised site safety and we unfortunately had to put a halt to the open day. We sincerely apologise for any inconvenience caused and to all those planning to come along. The past five months have revealed a fascinating insight into the history of this area. As we were unable to welcome you to the site in November, our Andover fieldwork team have made a fantastic on-site video to show you what we have been up to. Information panels produced for the Open Day are available to download below. Our investigations were initially due to be completed in December 2018 but, due to bad weather, we have been delayed. We will continue working on site into January 2019. Once we have finished, our specialists will analyse and record the information collected. We will then be able to build up a picture of the site, which we hope to share at another event in Wickham in 2019. Further details about this event will be available to view here soon.